The Filter effect contains both LPF (Low Pass Filter) and a HPF (High Pass Filter) switchable by clicking the corresponding buttons. A LPF filter is a filter that lets frequencies below the Cutoff frequency through and attenuates all frequencies above the Cutoff frequency. A HPF filter does the exact opposite of a LPF filter. The Resonance knob determines how much resonance will occur alongside attenuation giving a "ringing" feel to the sound. A Reverb is a delay unit which simulates reverberation, i.e. the remainder of sound in a room after the original sound has died out. Size governs how large that room is. Damp governs how much transients will be reproduced in that room. I.e. the difference between sounds played in a room with tiles or a room with heavy drapes all over. Width governs how much of the simulated reverb will be in Stereo or Mono, this gives the sound a wider, bigger character. Or in reverse, smaller more narrow feel. Wet governs loudness of the generated reverb. Dry governs loudness of the original sound. A delay unit (usually) records incoming audio and then plays it back after a set period of time to make the sound repeat itself, resulting in an echoing effect. Time Left governs the delay time in the left channel. Time Right governs the delay time in the right channel. Feedback governs how much of the delayed signal is routed back through the buffer, thereby creating feedback. Filter governs the cutoff of the low pass filter on the delay. Wet governs loudness of the generated delays. The Degrader is a Sample Rate/Resolution reduction effect which relies on the fact that reducing the Sample Rate of a signal introduces quantization distortion. This effect is often used to add a 'retro' quality to sounds, like those very popular gaming machines that had 8 bit sound. Gain governs the amplitude of the incoming signal to the effect. Rate governs how much sample rate reduction takes place. Reduction governs how much resolution reduction takes place. Mix will blend the degraded sound with the original sound. A phaser takes the input signal and splits it into two channels and either slightly delay, or phase shift, one channel creating a moving comb filter effect. The phase shift is modulated by an LFO to create a characteristic whooshing effect. Feedback governs how much of the delayed/phase shifted signal is routed back through that channel thereby accentuating the comb filter effect. Rate governs the speed of the sweep. Depth governs how low in the frequency spectrum the sweep should affect the signal. Color changes the perceived tone of the generated effect. Wet governs loudness of the phaser. Distortion is usually described as the result of any process that alters the signal shape or introduces new sound to the original. For example hiss generated by the recording equipment when recording. Distortion is also used to describe effects that in any way overdrives the original signal thereby causes the signal to clip. Our Distortion effect has 5 ways to squash and wreak havoc on your sounds. Clip is probably the simplest and most common mechanism for distortion, which occurs in the digital realm when a signal's amplitude is restricted by a set limit, for example, the Bit depth of the sequencer. In the analog world, this is achieved when a signal is driven beyond the gain capacity of an amplifier, effectively cutting off the tops of the sound wave. Foldback mirrors the signal back onto itself when the amplitude exceeds clipping level. Waveshaping(WS1 WS2 WS3) is a technique of distortion which explicitly alters the shape of the original waveform by forcing its amplitude to conform to the shape of a nonlinear transfer function, thereby giving the effect its own unique sound. Gain governs the amplitude of the input signal. Volume governs the amplitude of the output signal. Threshold governs when the compressor should start to compress the incoming signal. For example, if we imagine a signal has an amplitude register of 0 to 10 (0 being silent and 10 full volume), and you set the threshold to 6, the compressor will only compress the part of the signal that is louder than 6. Attack governs when the compressor kicks in after the signal has reached the threshold. By having a slow attack time you will allow for some of the snap/transients from the input signal to be unaffected. Release governs when the compressor will decrease gain reduction to the level determined by the ratio, in other words for how long it will compress the signal. Ratio governs how much compression takes place above the threshold. Gain often called "make up gain", governs how loud the output signal from the compressor will be. This is handy since you can bring back the volume you've lost. An equalizer is essentially a multimode filter capable of attenuating or raising different parts of a signals frequency spectrum. Our equalizer is very simple yet brutally effective with three different settings. Low governs amplitude between 20Hz to 880Hz of the frequency spectrum. Mid governs amplitude between 880Hz to 5 000Hz of the frequency spectrum. High governs amplitude between 5 000Hz to 20 000Hz of the frequency spectrum. For info on the Parametric EQ, click here. A limiter is a compressor with a higher ratio, and generally a fast attack time. Most engineers consider a compressor with a ratio of 10:1 or more as a limiter. A limiter does not allow any audio material whatsoever leave the limiter over the set threshold value. Threshold governs when the limiter should start limiting. Release governs when the limiter will decrease gain reduction. Gain often called "make up gain", governs how loud the output signal from the limiter will be. Fakie is meant to fake sidechain compression, a technique often used in EDM. Traditionally you would send a signal from the kick to a compressor on a different channel. That channel would then duck when the kick hits. This way the kick will always be heard clearly and you get a nice pumping effect. With Fakie it will duck automatically every quarter note, just adjust the timing and the amount. Attack governs how long it takes for the ducking to reach the lowest level. Hold governs how long the signal will stay at the lowest level. Release governs how long it will take for the signal to get back to normal after the hold. Depth governs how low the lowest level is, in other words, how strong the pumping effect is. Tremolo is an effect that modulates the volume rhythmically. It can create a trembling or auto panning sound. Speed governs how fast the volume shifts from low to high. Depth governs how strong the effect is. Phase governs if the right and left channel are in sync or not. They are in perfect sync at 100%. Having it set to 0% will create an auto-panning effect, moving the signal between the left and the right channel. The Butterworth Filter is a low pass filter. Unlike the regular filter, this doesn’t have the option of a high pass filter. It does, however, have a flatter response, giving it a different character. Cutoff governs the cutoff point where it lets through the frequencies below, and cuts the frequencies above. Resonance governs how much resonance will occur alongside attenuation giving a "ringing" feel to the sound. The Wubfilter works a lot like the filter + LFO section of The Wub Machine. 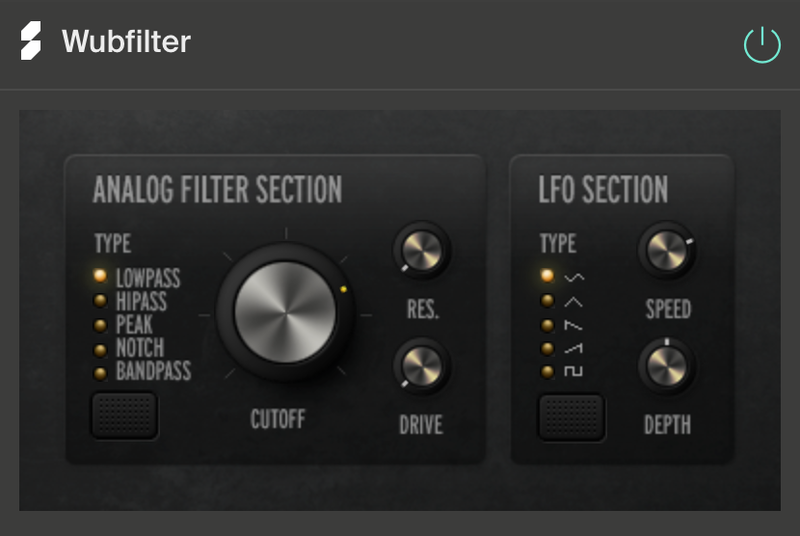 Compared to the other filters, the Wubfilter has more filter types and they can be automated with the LFO section. LFO stands for low frequency oscillator. In a synth, the oscillators are the sound makers. An LFO is inaudible and is meant to automate other settings. In this case, it’s automating the filter cutoff. Filter Type governs what kind of filter that is applied. There are five different types: low pass, high pass, peak, notch, and bandpass. Cutoff governs the cutoff point of the filter. Res governs how much resonance will occur alongside attenuation giving a "ringing" feel to the sound. Drive lets you drive the filter with a higher gain. LFO Type governs the shape of the LFO. Speed governs how fast the LFO moves. Depth governs how much the LFO will affect the movement of the cutoff. The Vocal Tuner is used to tune signals that are slightly out of key. Perhaps the most useful on vocals, but can be used on anything. It can be used subtly to make a singer sound better in a natural way. You can also use it as a cool effect, similar to artists like T-pain, Migos and Travis Scott. Root note & Scale governs what key and notes it will correct the signal to. It’s important that you choose the same key as your song. In the image above, C is the root note and Major is the type of scale. Amount governs how much correction will take place. At 0% it will not correct at all. At 100% it will be perfectly in pitch. Keep it lower for a natural sound and high for a more produced and perfect sound. Glide governs how fast the pitch correction is. At 0% it will be very robotic and at 100% it will be smoother and more natural.